Today I brought Pound Coffee, in Washington, DC, their second case of Tēvolution. This remarkable coffee shop, located in the heart of one of DC’s business districts, has proven itself the ideal location to launch our new business. Of course, all business starts with people, and this is no different. Pound’s co-founder, Karl Johnson (@karljohn on Twitter), is a down-to-earth guy who’s got the entrepreneurial bug just as strongly as I do. On the day we met, we spent an hour just talking about our businesses, how we started them, what we did in our day-jobs (both consultants) and what we hoped to accomplish. Our philosophies on building relationships, helping the community, and owning the rights to your own future were in lock-step. After discovering that, everything else would be easy. Pound itself is an earthy oasis in a steel downtown wasteland. With a menu of one comfort meal a day, Pound provides busy employees a place to step in, chill out, eat a meal that sticks to your ribs, and relax before hitting the grind again. They release their menu a month in advance on their website, and a taped sign in the window tells passers-by what today’s meal is. When I brought Karl the first case, there was no haggling, no process, no computer entry. He just pushed a few bottles in his case over to the right and loaded up 12 bottles of delicious Tēvolution. They sold in a week. Throughout the week he sent me tweets and emails letting me know how it was going, what we could do better, and pushing me to develop a sign or dangler or something to draw more people to the teas. He even mentioned us an article in the local community newsletter (see “Pound Expanding to the Hill”), which has already turned some heads. How cool is that? Today, as I walked in to bring him the second batch, I was in a hurry and in truth hoped to just drop them off and leave. But I was instantly reminded of what a good place this is, and Karl and I quickly got to talking about all things, and soon a half hour had gone by. We placed the new bottles on the shelf, we hung not one but three signs to tell customers about this new tea, and we talked about ways to work together in the future. 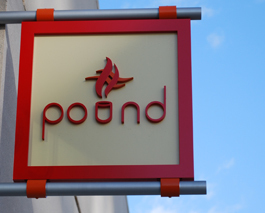 Pound is opening a new location in a few weeks on Capitol Hill, right behind the Capitol building. It will be a larger location, the clientele will be all the political junkies from the offices of power, and the expectation is that they’ll love Tēvolution. DC’ers love to do good, and tell their friends about it (that’s what Tēvolution does, if you didn’t know). And Karl is just as excited to bring them Tēvolution as I am. And I’m just as excited to bring them Pound as he is. And that’s the nature of a great relationship.